Oncolytic virotherapy may mediate antitumor effects via direct oncolysis or immune-mediated tumor regression. Although the ability of oncolytic viruses to generate adaptive antitumor immunity has been characterized, their interactions with the innate immune system are relatively unclear. Using a human in vitro system, this study investigates the innate immunological consequences of reovirus therapy and its potential to activate NK cell-mediated antitumor activity. Dendritic cells (DC) loaded with reovirus-infected human melanoma Mel888 cells (DC-MelReo), but not reovirus-infected tumor cells alone, induced IFN-γ production within the NK cell population upon coculture with PBMC, in a cell-to-cell contact-dependent manner. DC-MelReo secreted the chemokines CCL2, 3, 4, 5, 7, 8, 11, and CXCL10; these culture supernatants induced NK cell chemotaxis. 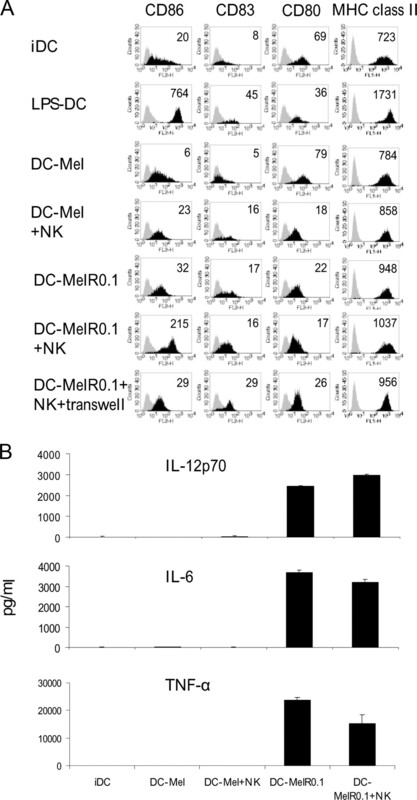 Coculture of DC-MelReo with purified NK cells induced reciprocal contact-dependent phenotypic DC maturation, while DC-MelReo elicited up-regulation of the activation marker CD69 on NK cells, in a partially contact and partially IL-12 dependent manner. Significantly, DC-MelReo induced NK cell cytotoxicity toward tumor cells by a type I IFN dependent mechanism. These data demonstrate that tumor infection by reovirus can act via DC to induce NK cell recruitment, activation, and cytotoxicity, along with reciprocal DC maturation. These findings suggest that reciprocal DC-NK cell interactions, following reovirus therapy, may play an important role in altering the immune milieu of the tumor microenvironment and mediating tumor regression. Oncolytic viruses are self-replicating, tumor-selective viruses, with an ability to directly induce cancer cell death in vitro (1). A range of oncolytic viruses have been investigated in clinical trials (2), and represent a promising novel approach to cancer therapy. Much of the preclinical data has involved immunocompromised xenograft models, investigating direct cytotoxic activity (3, 4). The host immune system is adept at responding to viral infections, and virotherapy in immunocompetent hosts is characterized by a significant influx of immune cells (5, 6, 7, 8). Hence, the immune response to viral infection is likely to be critical in determining the overall outcome of therapy, whether the effect is enhancement or loss of therapeutic efficacy through viral clearance (9). Viral infection of tumors provides pathogen-associated molecular patterns and immunological “danger” signals, potentially enhancing the immunogenicity of the tumor microenvironment (10). The majority of studies exploring the cellular immune responses to oncolytic virotherapy have focused upon cognate immune responses. The ability of several oncolytic viruses to infect tumors and to generate adaptive antitumor immunity has been well described (9, 11, 12, 13, 14, 15). On this basis, oncolytic virotherapy has been proposed as a novel form of immunotherapy (9). The generation of a cognate immune response is however shaped by the nature of the preceding innate response (16). Dendritic cells (DC),4 part of the innate arm of the immune system, play a pivotal role in coordinating the innate response by recruiting and reciprocally interacting with NK cells (17, 18), and adaptive T cell priming (17). The immunosuppressive tumor microenvironment can inhibit DC maturation (19, 20), and DC remain immature in the presence of growing tumors (21). DC are important mediators of early viral recognition via pattern recognition receptors (22). Virotherapy therefore has the potential to reverse the immunosuppressive effect of the tumor microenvironment upon DC, generating a more immunogenic milieu. In addition to influencing subsequent adaptive immune responses, innate immune activity can be directly cytotoxic to tumors. Among the innate components, strongest evidence for an anticancer role exists for NK cells (23). In addition to murine data supporting a role for NK cells in cancer immunosurveillance (23), tumor-infiltrating NK cells in humans correlate with a favorable prognosis (24, 25, 26, 27). However, in many human tumors, infiltrating NK cells are sparse (28, 29). Enhancing the infiltration and activation of NK cells within tumors represents a promising immunotherapeutic strategy. Conversely, the innate immune response may be detrimental to the success of oncolytic virotherapy. Rapid innate viral clearance is a significant barrier to oncolytic virotherapy, with an acute inflammatory reaction in response to viral infection potentially leading to rapid viral clearance (30). Indeed, oncolytic viruses are being designed to suppress the innate immune response (31, 32), or are being combined with agents aimed as suppressing innate antiviral responses (33). The role of the innate immune system in oncolytic virotherapy is therefore double-edged, with consequences ranging from rapid viral clearance, to activation of direct innate antitumor activity and the generation of subsequent cognate antitumor responses. However, despite the potential importance of the immune system, the interactions between the virus, host immune cells, and the tumor microenvironment remain largely uncertain (30). Reovirus (respiratory enteric orphan) is a nonenveloped double stranded RNA virus, isolated from the respiratory and gastrointestinal tracts of humans, and is nonpathogenic (34). Reovirus is under investigation as an oncolytic agent following observations that activated Ras pathways in tumors prevent RNA-dependent protein kinase from aborting viral infection, leading to cell lysis (35). Antitumor activity has been demonstrated in a range of different preclinical models, including melanoma, breast, colon, ovary, brain, and hematological malignancies (36), and phase I and II clinical trials are currently ongoing (36). We have previously demonstrated the immunogenic potential of reovirus (11, 37), and have shown that reovirus directly activated human DC, stimulating phenotypic maturation and cytokine secretion. In addition, reovirus-treated DC-activated NK cell cytotoxicity toward susceptible NK target cells, although the mechanism of NK cell activation was undefined (37). Subsequently, we have demonstrated the ability of reovirus-infected melanoma cell lines to generate adaptive antitumor immunity, in a murine in vivo model of lymph node metastases and in an in vitro human priming system (11). However, the key relationships between reovirus-infected tumor cells and innate immune effector cells have, to date, been defined. This study explores the interactions between reovirus-infected melanoma cells, DC, PBMC, and NK cells in a human in vitro system. Mel888 cells, a human melanoma cell line (Cancer Research U.K.), were grown in DMEM (Life Technologies) supplemented with 10% (v/v) FCS (Harlan Sera-Labs) and 1% l-glutamine (Life Technologies). Cells were routinely tested for mycoplasma and found to be free of infection. PBMC and isolated NK cells were used in experiments in lymphocyte growth medium (RPMI 1640 supplemented with 10% (v/v) human AB serum (Sigma-Aldrich), 1% (v/v) l-glutamine, 1% (v/v) sodium pyruvate, 1% (v/v) nonessential amino acids, and 1% HEPES (Life Technologies)). PBMC were obtained from buffy coats of healthy blood donors by Ficoll-Hypaque density centrifugation, and monocytes were isolated by MACS CD14+ selection (Miltenyi Biotec) as previously described (38). Immature DC were generated by culture of monocytes in DC medium (RPMI 1640 supplemented with 10% FCS, 1% l-glutamine, 800 U/ml GM-CSF (MBL) and 500 U/ml IL-4 (R&D Systems)) for 5 days. NK cells were isolated from PBMC frozen at −80°C using MACS negative depletion kits following the manufacturer’s protocol (>90% purity) (Miltenyi Biotec). Reovirus type 3 Dearing strain was provided by Oncolytics Biotech in PBS and stored at neat concentrations at −80°C (long term storage) or at 4°C (maximum 3 mo). Virus titer was determined by a standard plaque assay using L929 cells. Mel888 cells were seeded and allowed to adhere for 6 h before reovirus infection at either 0.1 or 1 pfu/cell as indicated. After an 18 h infection, Mel888 cells were harvested and cultured with DC at a 3:1 ratio in DC medium, at a concentration of 2 × 105 DC/ml. Mel888-reovirus loaded DC (DC-MelReo) cocultures were harvested after 24 h. Cell-free supernatants were stored at −80°C. Supernatants from Mel888 cells ± reovirus and DC-MelReo cocultures for chemotaxis assays were generated in the same manner using DC medium containing only 1% FCS. Levels of IL-12p70, IL-6 (BD Biosciences), and TNF-α (Biosource) in tissue culture supernatants were measured by ELISA using matched paired Abs, according to manufacturers’ instructions. IFN-β was assayed as per manufacturer’s instructions using an IFN-β ELISA kit (PBL IFN Source). Chemokines in tissue culture supernatants were assayed using the chemokine human 10-plex kit (CCL2 (MCP-1), CCL3 (MIP-1α), CCL4 (MIP-1β), CCL5 (RANTES), CCL7 (MCP-3), CCL8 (MCP2), CCL11 (Eotaxin), CXCL10 (IP-10), MIG (CXCL9), and GRO-α (CXCL1)) and the IFN-α human singleplex bead kit (Invitrogen) as per the manufacturer’s protocol. A Bioplex Luminex 100 XYP instrument was used for analysis. Chemokine concentrations were calculated using STarStation software (Applied Cytometry Systems) with a four parameter curve-fitting algorithm applied for standard curve calculation. Tissue culture supernatants for assessment of chemotaxis were generated in DC medium containing 1% FCS, as described above. Chemotaxis of NK cells was assessed using a Transwell system. Five hundred microliters of supernatants was added to the lower chamber of Transwell plates with 5-μm pores (Costar, Corning). Five × 105 NK cells in 100-μl medium were added to the upper chamber, and plates were incubated for 3 h at 37°C. Checkerboard assays, in which the NK cells were also suspended in the test medium, were performed to assess random migration. Cells in the lower wells were harvested, stained with anti-CD56-PE and anti-CD3-FITC, and transferred to Trucount flow cytometry tubes (BD Biosciences) to facilitate accurate cell counting. Analysis was performed by flow cytometry. An NK cell (CD56+CD3−) to bead ratio was determined for each tube. A migration index was calculated by normalizing this ratio to that obtained in medium alone controls. All samples were performed in triplicate. DC-MelReo were harvested and resuspended with PBMC at a 1:5 ratio in lymphocyte growth medium, at 1 × 106 PBMC/ml. Where indicated, PBMC were separated from DC-MelReo by Transwell filters (0.4 μm) (Greiner Bio-One). DC-MelReo/PBMC cocultures were established as above, and Brefeldin A 10 μg/ml (Sigma-Aldrich) was added after 8 h. After a further 16-h incubation, PBMC were stained with anti-CD56-PE (Serotec), anti-CD3-PerCP (BD Pharmingen) and fixed in 1% paraformaldehyde (PFA). Cells were subsequently permeabilized with 0.3% saponin, and stained with goat anti-human IFN-γ-FITC (BD Pharmingen) before flow cytometry (FACSCalibur, BD Bioscienes). DC-MelReo were harvested and resuspended with isolated NK cells at a 1:5 ratio in lymphocyte growth medium, at 1 × 106 NK cells/ml. Where indicated, NK cells were separated from DC-MelReo by Transwell filters (0.4 μm). Cultures were set up in the presence or absence of the indicated neutralizing Abs or isotype control. Mouse anti-human IL-12 (10 μg/ml) and mouse IgG1 isotype (10 μg/ml) (both R&D Systems) were used to test the role of IL-12. Anti-IFN-αβ block consisted of a polyclonal sheep anti-human IFN-α, a sheep polyclonal anti-human IFN-β (both used at 1.5%), plus mouse anti-IFN-αβ receptor chain 2 mAb at 12.5 μg/ml (all PBL Biomedical Laboratories) as previously described (39); isotype controls consisted of sheep serum (Sigma-Aldrich) and mouse IgG2a isotype control (R&D Systems) at 12.5 μg/ml. Following 48-h incubation of DC-MelReo ± NK cell cocultures, cells were harvested and labeled with anti-HLA-DR-FITC (Serotec), anti-CD80-PE, anti-CD83-PE, anti-CD86-PE, and anti-CD11c-allophycocyanin (all BD Pharmingen), with matched isotype controls. Analysis was performed by flow cytometry using a FACSCalibur (BD Biosciences), and DC were identified in mixed cell population by gating on CD11c-allophycocyanin positive cells. Following 24-h incubation of DC-MelReo/NK cell cocultures, cells were harvested and labeled with dead cell discriminator (Miltenyi Biotec) as per the manufacturer’s protocol. Cells were subsequently labeled with anti-CD56-PE (Serotec), anti-CD3-PerCP, and anti-CD69-allophycocyanin (BD Pharmingen) or mouse IgG1-allophycocyanin isotype control (R&D Systems), and fixed in 1% PFA. Analysis was performed by flow cytometry, gating on live lymphocytes, excluding cells labeled with dead cell discrimator and anti-CD3 in the FL3 channel. CD107 is a marker of lysosomal granule exocytosis, and was used, as previously described (40), as a marker of NK cell degranulation. NK cells and tumor targets were incubated at a 1:1 ratio in the presence of anti-CD107a-FITC and anti-CD107b-FITC Abs (BD Biosciences); brefeldin A (10 μg/ml) was added 1 h after initial coculture. Four hours later, cells were labeled with dead cell discriminator, stained with anti-CD56-PE, anti-CD3-PerCP, anti-CD69-allophycocyanin, then fixed in 1% PFA. Analysis was performed by flow cytometry, gating on lymphocytes, excluding cells labeled with dead cell discriminator and anti-CD3 in the FL3 channel. Cytotoxicity was measured using a standard 4-h 51Cr assay (38). Percent lysis was calculated using the formula: % lysis = 100 × (cpm experiment – cpm spontaneous release)/(cpm maximum release − cpm spontaneous release). p values were calculated using an unpaired Student’s t test with two-tailed distribution and two-sample unequal variance variables. DC loaded with reovirus-infected melanoma cells induce IFN-γ production by NK cells within PBMC in a contact-dependent manner. To address the potential innate immune consequences of reovirus therapy of tumors we initially addressed the effect of reovirus alone, reovirus-infected Mel888 cells (MelReo) and immature DC-MelReo upon PBMCs. IFN-γ has a multitude of effects including the induction of Th1 immune responses (41) and the activation of APCs (42). IFN-γ production was assessed by ELISA of tissue culture supernatants after 48 h incubation. DC-MelReo in the absence of PBMCs did not secrete IFN-γ, and MelReo failed to induce IFN-γ secretion in PBMCs. Although DC loaded with uninfected Mel888 (DC-Mel) did not induce IFN-γ, high levels were produced when DC-MelReo were cocultured with PBMCs (Fig. 1⇓A). Intracellular staining confirmed the generation of IFN-γ by PBMCs following coculture with DC-MelReo (Fig. 1⇓B). To determine which cells within the PBMC population were producing IFN-γ, the PBMC population was subgated into CD56+ and CD56− populations. The CD3-CD56+ NK cell population were the predominant IFN-γ producers, although the smaller CD3+CD56+ population, consistent with NKT cells, also contributed. Minimal IFN-γ production was observed in the CD56− population (Fig. 1⇓B). DC-MelReo induced IFN-γ production in NK cells (gated as CD3−CD56+ cells), in contrast to direct reovirus, MelReo in the absence of DC, or DC loaded with uninfected Mel888 cells (Fig. 1⇓C). In this system, cultured DC therefore appear to be critical in mediating the activation of NK cells within the whole PBMC population to secrete IFN-γ. To further investigate the DC-MelReo and PBMC/NK cell interaction, these experiments were performed in the presence of a Transwell to separate the cell populations. IFN-γ secretion was largely dependent upon cell-to-cell contact between the DC-MelReo and the PBMC/NK cells as assessed by ELISA (Fig. 1⇓D) and staining for intracellular IFN-γ production (Fig. 1⇓E). DC-MelReo induce IFN-γ production in the NK cell population within PBMCs. DC were loaded with Mel888 or Mel888 preinfected with reo0.1 or 1 pfu/cell, or equivalent numbers of DC or Mel888 cells were seeded alone. After 24 h culture, cells were harvested and cocultures were set up with PBMCs. Equivalent numbers of Mel888 cells were added in cocultures without DC. Reovirus was added directly to PBMC at 0.1 pfu/cell (PBMC+R), as indicated. A, Supernatants were harvested after 48 h, and the production of IFN-γ was determined by ELISA. Data represent means of triplicates ± SE (n = 6). B, Brefeldin A was added 8 h into the coculture, and intracellular IFN-γ production was determined after 16 h by flow cytometry. Data shown are representative of six independent experiments. C, The proportion of NK cells staining for intracellular IFN-γ was determined by gating on CD3-CD56+ lymphocytes. Data shown in B and C are representative of six independent experiments. 0.4 μm Transwells (T) were used to separate PBMC from DC (D and E). D, IFN-γ secretion assayed by ELISA after 48 h (data represents mean of triplicates ± SE (n = 2). E, Intracellular IFN-γ staining was determined as in B by flow cytometry, and the proportion of NK cells staining for IFN-γ analyzed as in C. Data are representative of six independent experiments. NK cell infiltration into tumor tissue is limited (28, 29). To exert effector functions, NK cells are recruited from blood into tissues and this trafficking is regulated by a host of chemokines (43). An early influx of immune cells, including NK cells, has been observed in response to tumor viral therapy (5, 6, 7). To determine the ability of reovirus to potentially induce NK cell infiltration, the secretion of chemokines from MelReo and DC-MelReo was determined (Fig. 2⇓A). Only low or undetectable chemokine concentrations were present in the supernatants of MelReo or DC-Mel. By contrast, high levels of chemokines were secreted by DC-MelReo, including CCL2, 3, 4, 5, 7, 8, and 11, and CXCL10. The chemokines CXCL1 and CXCL9 were present at very low or undetectable levels for all conditions (data not shown). DC-MelReo produce chemokines which mediate NK cell chemotaxis. DC were cultured with Mel888 or MelReo and supernatants harvested after 24 h. A, A human 10-plex chemokine luminex was used to assay a range of chemokines. Results shown are representative of four independent donors. B, NK cell chemotaxis was assessed using a Transwell assay. Five micrometer Transwells were used to separate NK cells from supernatants, and migration of NK cells into the tissue culture supernatants determined after 3 h by a flow cytometric method. As a control to assess random migration, NK cells were also suspended in supernatant (no chemokine gradient). Data represent means of triplicate wells ± SE, and is representative of six similar experiments (∗, p = 0.036; ∗∗, p = 0.031). Although NK cells have been shown to respond to each of these chemokines individually, they may also act in a coordinated fashion to mediate NK cell recuitment (43). A Transwell system was therefore used to assess the ability of the chemokine mixture secreted by DC-MelReo to recruit human NK cells. Consistent with the pattern of chemokine secretion, supernatants from MelReo and DC-Mel had minimal effects upon NK cell migration, while supernatants from DC-MelReo induced a statistically significant increase in NK cell migration across the Transwell (Fig. 2⇑B). A “checkerboard” assay, in which supernatant was added to both the upper and lower chambers of the Transwell, abolished the enhancement of NK cell migration. NK cell migration across the Transwell was therefore due to the chemokine gradient, and not a general increase in NK cell chemokinesis. These data suggest that DC are key mediators of immune cell recruitment following tumor infection by reovirus. High levels of chemokines secreted by DC-MelReo are likely to mediate NK cell recruitment into tumors and/or lymph nodes, where they may interact with migrated DC (DC can potentially interact with infected tumor cells either in the periphery or once they have reached a tumor-involved node draining the primary; Ref. 44). The chemotaxis of NK cells provides a basis for potential ongoing DC-NK cell interactions which can shape the locoregional innate response to reovirus infection of tumors. Multidirectional interactions between DC and innate lymphocytes are considered to play important roles in shaping both innate and adaptive immune responses (17). In this manner, infiltrating innate immune lymphocytes may modulate and potentially amplify an ongoing immune response initiated by reovirus. We have previously shown that after a 24 h coculture of DC and tumor cells, DC-Mel are immature, by phenotypic profile and cytokine secretion. By contrast, DC-MelReo are matured in a reovirus-dose dependent manner, although DC-MelReo loaded with tumor cells infected at an MOI of 0.1 (DC-MelReo0.1) display only minor phenotypic maturation and cytokine secretion after 24 h (11). To explore the interactions between DC-MelReo and NK cells following NK cell recruitment, loaded DC were harvested after 24 h, and cultured with or without NK cells for a further 48 h. LPS-matured DC were included as a positive control. DC-Mel remained phenotypically immature with a similar median fluorescence intensity of activation markers to immature DC (Fig. 3⇓A) and undetectable levels of IL-12p70, IL-6, and TNF-α (Fig. 3⇓B). There was no significant further activation in the presence of NK cells. DC-MelReo0.1 cultured in the absence of NK cells remained phenotypically immature, with minor up-regulation of the costimulatory molecules CD86 and MHC class II (Fig. 3⇓A), although they secreted high levels of IL-12p70, IL-6, and TNF-α during the coculture (Fig. 3⇓B). 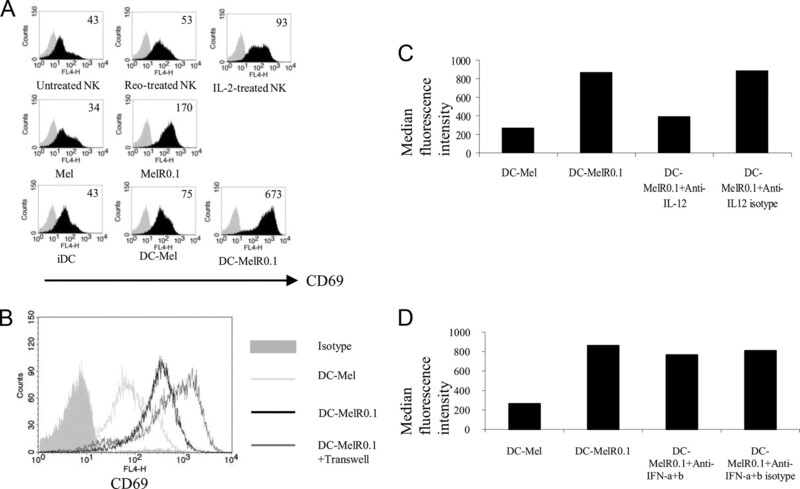 Following culture with NK cells, DC-MelReo0.1 had a marked up-regulation of CD86 and MHC class II expression, compared with DC-MelReo0.1 cultured alone. CD80 and CD83 expression was largely unaffected (Fig. 3⇓A). Cytokine secretion by DC-MelReo0.1 was not enhanced by additional coculture with NK cells (Fig. 3⇓B). A Transwell system was used to separate DC-MelReo0.1 from the NK cells, and revealed that the phenotypic activation of DC loaded with reovirus-infected tumor cells by NK cells was cell contact dependent (Fig. 3⇓A). NK cells induce phenotypic activation of DC-MelReo. DC were loaded overnight with Mel888 or Mel888 preinfected with reo0.1 or 1 pfu/cell, or DC were seeded alone. Cells were harvested, and cocultures were established on the following day with a DC-NK cell ratio of 1:5. To test contact dependence, NK cells were separated from DC by a 0.4-μm Transwell. Samples were harvested after 48 h. A, Surface expression of CD86, 83, 80, and MHC class II were analyzed by flow cytometry, gating on CD11c+ DC. Gray = isotype, Black = marker. Median fluorescence intensity is shown in top corner. B, Cell supernatants were harvested and IL-12p70, IL-6, and TNF-α were determined by ELISA. Data represent triplicate wells ± SE. Data shown are representative of four independent experiments. The ability of DC to activate NK cells is potentially an important component of antitumor therapy (42). We first defined the influence of DC-MelReo on the expression of the NK cell activation marker CD69. Cells were cocultured for 24 h, before assessment of CD69 expression on the NK cells. DC-Mel or direct reovirus added to NK cells failed to increase CD69 expression, while MelReo induced minor CD69 up-regulation. By contrast, DC-MelReo induced a high level of CD69 expression on NK cells (Fig. 4⇓A). NKG2D expression was not altered (data not shown). Transwell experiments demonstrated that up-regulation of CD69 on NK cells cocultured with DC-MelReo was partially contact dependent (Fig. 4⇓B). The activation of NK cells by DC has been reported to involve cell contact and secretion of cytokines including IL-12 and type I IFN (39, 42). To evaluate the role of IL-12 and type I IFN in the up-regulation of CD69 expression on NK cells, cultures were performed in the presence of a mixture of type I IFN neutralizing Abs, an IL-12 neutralizing Ab, or appropriate isotype controls. IL-12 neutralization significantly abrogated the DC-MelReo induced up-regulation of CD69 expression on NK cells (Fig. 4⇓C). By contrast, blockade of type I IFN had no effect upon CD69 expression (Fig. 4⇓D). DC-MelReo induce NK cell phenotypic activation, in a partially contact and IL-12 dependent manner. A, DC-NK cell cocultures were established as in Fig. 3; equivalent numbers of Mel888 cells were added in cocultures without DC. Reovirus at 0.1 pfu/cell (NK+R) or IL-2 (50IU/ml) were added to the NK cells as indicated. Cells were harvested at 24 h. CD69 expression was analyzed by flow cytometry, gating on lymphocytes, excluding dead cells (using dead cell discriminator), and gating on CD56+CD3− cells. Gray = isotype, Black = anti-CD69. B, A 0.4-μm Transwell separating DC and NK cells was used to test the contact dependence of phenotypic NK cell activation. Data shown for A and B are representative of four independent experiments. C, Cocultures were performed in the presence or absence of anti-IL-12 mAb or anti-IL-12 isotype control. D, Cocultures were performed in the presence or absence of anti-IFN-αβ Abs or anti-IFN-αβ isotype control. Data shown for C and D are representative of three independent experiments. In addition to reciprocal effects upon DC, the cytotoxic effector function of NK cells may mediate direct antitumor effects. Following a 48 h coculture with DC-MelReo, NK cell cytotoxicity was assessed by NK cell degranulation in response to MHC class I positive (data not shown) Mel888 cell targets (Fig. 5⇓A), and by 51Cr release assays (Fig. 5⇓B). Neither MelReo or DC-Mel were able to induce significant NK cell degranulation (Fig. 5⇓A) or Mel888 target lysis (Fig. 5⇓B). By contrast, DC-MelReo consistently induced NK cell degranulation toward Mel888 targets (Fig. 5⇓A) and Mel888 target lysis (Fig. 5⇓B). DC-MelReo were also found to induce NK degranulation and cytotoxicity toward a second tumor target, K562 (data not shown). NK cell degranulation was not seen in the absence of tumor target cells (data not shown). DC-MelReo activated NK cells were only slightly less cytotoxic than NK cells activated by the addition of the stimulatory cytokine, IL-2. Hence, reovirus can induce an NK cell antitumor effect, mediated via DC recognition of infected tumor cells and subsequent DC-NK cell cross talk. DC-MelReo-stimulated NK cells are cytotoxic toward Mel888 cells. NK cells were cultured as described in Fig. 3, with the indicated conditions; IL-2 was added to NK cells alone at 50 IU/ml. Cells were harvested after 48 h. A, Harvested cells were cocultured at a 1:1 ratio with Mel888 cells for 5 h, and NK cell degranulation assessed by a standard CD107 assay, gating on live CD56+CD3− cells. Data shown are representative of four independent experiments. B, Cytotoxicity toward Mel888 cells was assessed by a 51Cr release assay. Data represent means of triplicate wells ± SE. Data shown are representative of three independent experiments. To confirm that NK cells isolated from frozen PBMC behave similarly to freshly isolated NK cells, the ability of DC-Mel and DC-MelR to induce cytotoxicity in both freshly isolated and previously frozen NK cells was assessed (using blood from volunteer donors). DC-Mel failed to induce cytotoxicity in NK cells prepared by either method, while DC-MelR induced similar levels of both CD69 up-regulation and NK cell degranulation toward Mel888 cell targets in both freshly isolated NK cells and NK cells from frozen stocks (data not shown). To explore the mechanism of the induction of cytolytic activity of NK cells in this system, DC-MelReo and NK cells were cultured in the presence or absence of Transwells, before assessment of NK cytolytic activity toward Mel888 target cells by CD107 degranulation (Fig. 6⇓A) or 51Cr release (Fig. 6⇓B). DC-MelReo induced NK cell degranulation (Fig. 6⇓A) and cytotoxicity (Fig. 6⇓B) in a noncontact-dependent manner. Moreover, cell-free supernatant fluid from DC-MelReo induced NK cell cytotoxicity indicating that NK cell activation is mediated by a soluble factor (data not shown). DC-MelReo activate NK cell cytoxicity via secretion of type I IFN. NK cells were cocultured with DC-Mel or DC-MelReo0.1 as described in Fig. 3. In A and B, to assess the contact dependence, a 0.4 μm Transwell (T) was used to separate NK cell and DC conditions. Cells were harvested after 48 h. A, NK cell degranulation toward Mel888 targets was assessed by a CD107 degranulation assay. Data shown are representative of four independent experiments. B, Cytotoxicity toward Mel888 cells was assessed by a 51Cr release assay. Data represent means of triplicate wells ± SE. Data shown are representative of three independent experiments. C, IFN-β was assayed by ELISA. Data represent duplicate wells ± SE. Data shown are representative of six independent experiments. D, NK cell cocultures with DC-MelReo0.1 were performed in the presence or absence of anti-IFN-αβ Abs, anti-IFN-αβ isotype control, anti-IL-12 mAb, or an anti-IL-12 isotype control. Cells were harvested after 48 h and NK cell degranulation toward Mel888 targets was assessed by a CD107 degranulation assay. Analysis was performed by gating upon the lymphocyte population, excluding dead cells, and gating CD56+CD3− cells. Data shown are representative of three independent experiments. E, NK cell cocultures with DC-Mel were performed in the presence or absence of exogenous IFN-β 1500 pg/ml. Cells were harvested after 48 h, and NK cell degranulation toward Mel888 targets was assessed by a CD107 degranulation assay. Data shown are representative of two independent experiments. The hallmark of an antiviral response is the production of type I IFN (22). Type I IFN have previously been shown to augment NK cell cytotoxicity (39). Very low levels of IFN-β were secreted by MelReo, and no detectable IFN-β was secreted by DC-Mel. By contrast, high levels of IFN-β were detected in supernatants from DC-MelReo cultures (Fig. 6⇑C). IFN-α was not secreted by MelReo, DC-Mel, or DC-MelReo in six independent experiments (data not shown). The role of type I IFN in inducing NK cell cytotoxicity was assessed using neutralizing Abs. A combination of IFN-α, IFN-β, and IFN-αβ receptor-neutralizing Abs, present throughout the DC-MelReo/NK coculture, abrogated the induction of cytolytic activity of NK cells by DC-MelReo (Fig. 6⇑D). By contrast, IL-12-neutralizing Abs did not reduce NK cell degranulation toward Mel888 cell targets, despite a reduction in CD69 up-regulation (Fig. 6⇑D). Consistent with the role of IFN-β secretion by DC-MelReo in inducing NK cytotoxicity was the observation that the addition of IFN-β to DC-Mel cocultures with NK cells was sufficient to induce a degree of NK cytotoxicity toward Mel888 cells (Fig. 6⇑E). Therefore, the secretion of IFN-β by DC-MelReo is required to mediate the induction of NK cell cytotoxicity. The primary aim of oncolytic virotherapy has been to promote direct viral cytotoxicity toward tumor cells. Viral infection and tumor cell death would however be expected to be proinflammatory, with immune cell activation via viral pathogen-associated molecular patterns (45) and endogenous danger signals released from dying tumor cells (10). Indeed, tumor cell infection by a variety of different oncolytic viruses, including reovirus, vaccinia, HSV, adenovirus, and parvovirus has been shown to facilitate the priming of an adaptive antitumor response in human and murine systems (9, 11, 12, 13, 14, 15). However, the initial immune response to oncolytic virotherapy is innate, and the innate immune response is known to play a central role in the generation of subsequent adaptive effector mechanisms (16). Only limited data, largely from murine systems, are available characterizing the innate immune response following oncolytic virotherapy. These data have highlighted a potentially central role for the innate immune system in mediating the tumor response to therapy. For example, intratumoral therapy of a murine melanoma, B16ova, by vesicular stomatitis virus was associated with a pronounced leukocyte infiltrate, while tumor regression was dependent upon NK cells in addition to CD8+ T cells (5). Consistent with these data, oncolytic HSV therapy induces an inflammatory infiltrate containing NK cells and monocytes as well as T cells (8). Furthermore, the efficacy of intratumoral therapy of a metastatic melanoma by HSV was abrogated in syngeneic models lacking NK or T cell subsets (46). Hence, a full understanding of the interaction between virus, tumor microenvironment and innate and adaptive immune mechanisms, is critical to fulfilling the promise of these novel therapeutic agents. We have previously shown that reovirus infection of melanoma cell lines can generate adaptive antitumor immunity, in human and murine systems (11). The production of neutralizing Abs has been identified as a potential obstacle to the systemic delivery of reovirus to tumors (47), although recent data using a combination therapy with cyclophosphamide in murine models has shown promise in reducing the generation of neutralizing Abs and promoting viral delivery (48). However, the importance of the cellular innate immune response to reovirus therapy remains uncertain. DCs have a central role in innate and adaptive immune responses (16, 17). Tumor-infiltrating DC interact with immune cells within the tumor microenvironment, and migrate to tumor draining lymph nodes where they can interact with a wide repertoire of immune cells or even metastatic tumor cells. Tumor-infiltrating DC have been identified in a range of human cancers (49, 50, 51, 52, 53). However, the ability of infiltrating DC to mature has been reported to be impaired (19, 20, 49). This defect of function of tumor infiltrating DC is one of many mechanisms of tumor immunosubversion. We have previously demonstrated that reovirus activates DC (11, 37). In addition, DC-Mel fail to mature in response to LPS; this hyporesponsiveness is overcome by addition of reovirus (our unpublished data). These observations indicate that reovirus has the potential to alter the immunogenicity of the tumor microenvironment and draining lymph nodes following virotherapy. In this study, we have characterized the innate immune consequences of reovirus therapy, including the role of DC, using a human in vitro system. Initially, the effect of reovirus upon IFN-γ secretion by PBMCs was explored, in the context of free reovirus, MelReo, or DC-MelReo (Fig. 1⇑). 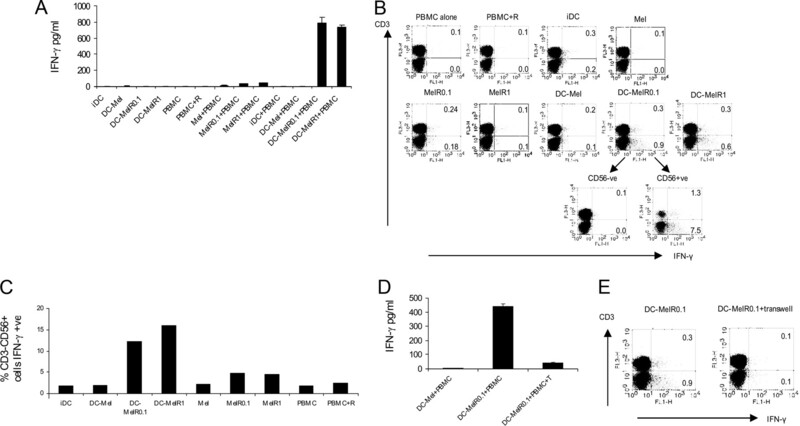 Free reovirus or MelReo failed to induce significant IFN-γ production in PBMCs, while DC-MelReo elicited high levels of IFN-γ secretion, from the NK cell subpopulation, in a cell to cell contact-dependent manner (Fig. 1⇑). IFN-γ produced by NK cells has been shown in other systems to be critical for the subsequent generation of tumor-reactive CTLs (54). DC therefore appear to be key reovirus sensors in the innate response. Although the presence of significant numbers of NK cells in tumors is a favorable prognostic feature (24, 25, 26, 27), NK cell infiltration is commonly limited (28, 29). Therefore, a therapeutic NK cell dependent response to virotherapy may include enhancing recruitment of NK cells into the primary or metastatic tumor microenvironment. Moreover, NK cell recruitment to lymph nodes is necessary for the generation of a Th1-adaptive immune response (54), and tumor-infiltrating DC, or those that have migrated from tumor tissue to lymph nodes, may mediate NK cell recruitment. By contrast to DC-Mel, DC-MelReo produced significant levels of a range of chemokines (Fig. 2⇑A), which have previously been linked with an ability to induce NK cell migration either alone or in combination (43). In addition, supernatants from DC-MelReo induced significant levels of NK cell chemotaxis across a Transwell (Fig. 2⇑B). Checkerboard experiments, in which the chemokine gradient was lost by introducing the same medium above and below the Transwell, excluded the possibility that this effect was simply due to increased NK cell chemokinesis. Although this study only investigated NK cell chemotaxis, the chemokines generated are likely to recruit other cell types. For example, CCL3, CCL4, and CCL5 attract immature DC (55), potentially increasing DC-NK cell interactions. Our findings with reovirus are consistent with those observed with HSV-1716. This oncolytic virus induces the production of the chemokines CXCL9 and CXCL10 from human DCs, and induces NK and CD8+ T cell migration into murine tumor models (6). Having demonstrated that DC-MelReo induce IFN-γ production from NK cells within PBMCs and secrete chemokines to recruit NK cells, we wished to further characterize the interaction between DC and NK cells. The DC-NK cell interaction is bidirectional and complex, involving soluble factors and cell contact (42). We have previously shown the ability of reovirus-infected Mel888 cells to mature DC in a reovirus-dose dependent manner (11). This maturation is likely to be related to the direct effect of reovirus upon DC (37), as reovirus added after DC are loaded with tumor cells is immunogenic in the absence of tumor cell infection (56). DC-MelReo0.1 are phenotypically immature in the absence of NK cells. However, DC-MelReo0.1 mature phenotypically after coculture with NK cells, in a contact dependent manner (Fig. 3⇑A). This requirement for contact for phenotypic DC activation is consistent with other human studies (57, 58). Secretion of the DC-derived cytokines, IL-12p70, IL-6, and TNF-α, was unaffected (Fig. 3⇑B). The activation of NK cells by DC represents a pathway which may be important in directly mediating NK cell-dependent antitumor effects. DC-MelReo induced marked up-regulation of the activation marker CD69 on NK cells (Fig. 4⇑A). MelReo in the absence of DC, or direct reovirus, were unable to similarly up-regulate CD69. The use of Transwells in DC-MelReo and NK cocultures demonstrated that CD69 up-regulation was partially contact dependent (Fig. 4⇑B). IL-12 and type I IFN have previously been shown to have a role in NK cell activation (42). Blocking experiments with neutralizing Abs revealed a role for IL-12 (Fig. 4⇑C) but not type I IFNs (Fig. 4⇑D) as the soluble factor involved. In addition to inducing CD69 up-regulation, DC-MelReo importantly induced NK cell cytotoxicity toward Mel888 cell targets. NK cells cultured with DC-MelReo for 48 h degranulated in response to Mel888 cells (Fig. 5⇑A) and efficiently lysed Mel888 targets (Fig. 5⇑B). By contrast, MelReo or DC conditions in the absence of reovirus failed to induce NK cell cytotoxicity. To elucidate the mechanism by which DC-MelReo induce NK cell cytotoxicity, Transwells were used to separate the cell populations before assessing NK cytotoxicity. NK cells separated from DC-MelReo by a Transwell consistently exhibited high levels of degranulation (Fig. 6⇑A) and cytotoxicity (Fig. 6⇑B) toward Mel888 targets. These data imply that a soluble factor (rather than DC/NK cell contact) is responsible for mediating the induction of NK cell cytotoxicity. Previous studies have demonstrated a role for type I IFNs in the induction of NK cell cytotoxicity (39, 42, 59). 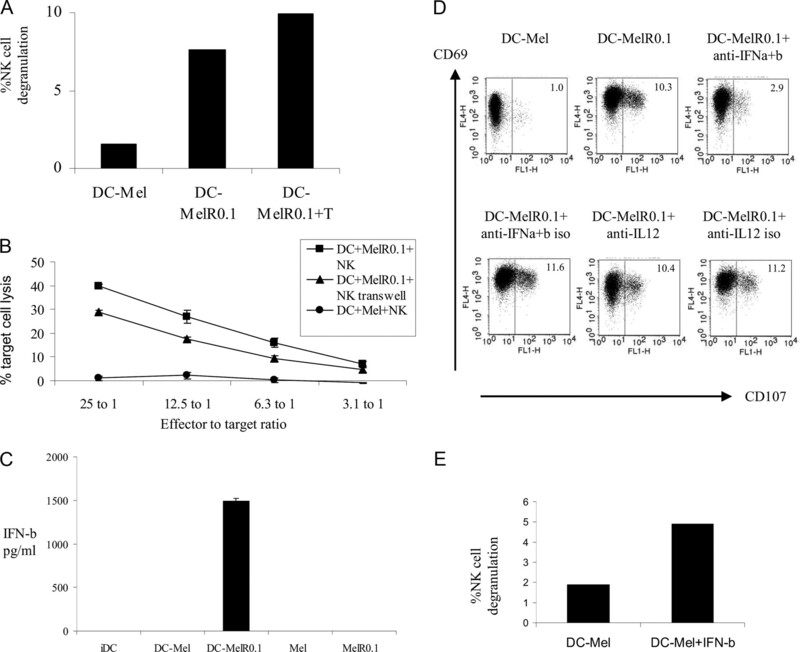 DC-MelReo secreted high levels of IFN-β (Fig. 6⇑C), but no detectable IFN-α (data not shown). By contrast, DC-Mel did not secrete type I IFN. These findings are consistent with published data showing that TLR signaling in myeloid DC couples to the production of IFN-β, while similar pathways in plasmacytoid DC generate IFN-α (22). In our system we have focused on myeloid DC as potential sensors of viral infection, as they are the predominant subtype of DC found within tumors (53). Neutralization of type I IFNs inhibited the induction of NK cell cytotoxicity (Fig. 6⇑D). Neutralization of IL-12 had no effect upon the induction of NK cell cytotoxicity, despite the involvement of IL-12 in CD69 up-regulation on NK cells (Fig. 6⇑D). Consistent with these data, the addition of exogenous IFN-β to DC-Mel was able to induce NK cell cytotoxicity (Fig. 6⇑E). The mechanisms of NK cell activation by DC-MelReo are complex, involving cell-to-cell contact for IFN-γ production, cell-to cell contact and IL-12 for CD69 up-regulation, and type I IFNs in the induction of cytotoxicity. In terms of inducing therapeutic NK cell cytotoxicity within a tumor, the ability of reovirus to induce production of IFN-β by DC is likely to be central to therapy. We have previously shown that DC-MelR0.1 efficiently prime specific adaptive antitumor immune responses (11, 56). In these previous studies, DC-MelR0.1 were cultured with PBMC over a 2–3 wk period, and the cytotoxic effector cells generated were CD8+ T cells. By contrast with the results presented in this study, demonstrating NK cell cytotoxicity after a 2-day coculture of PBMC with DC-MelR0.1, there was no evidence of significant innate NK cell degranulation toward Mel888 cell targets after 2–3 wk priming cultures. However, reciprocal activation of DC by NK cells is recognized to provide a link between innate and adaptive immune responses (17, 42). Therefore, the reciprocal interactions between DC-MelR0.1 and NK cells, shown in this study, leading to phenotypic DC maturation (Fig. 3⇑A), may provide an explanation for the efficiency of phenotypically immature DC-MelR0.1 in priming adaptive antitumor immunity at later timepoints. In summary, this study has demonstrated in a human system that reovirus infection of tumor cells has a pronounced activating innate effect, which is mediated via DC. DC-MelReo induce NK cell IFN-γ secretion, secrete chemokines that recruit NK cells, phenotypically activate and induce cytotoxicity in NK cells, as well as are reciprocally activated themselves. The interaction between DC-MelReo and NK cells is complex, involving cell-contact, IL-12, and type I IFNs. Understanding the immune response to reovirus and its role in therapy is essential in guiding attempts to optimize therapeutic efficacy by modulating the immune response. This study highlights the potential for reovirus to modulate the tumor microenvironment via reciprocal DC-NK cell interactions, harnessing the innate immune system for antitumor therapy. ↵1 R.J.P., F.E., K.J.H., and A.A.M. are supported by grants from Cancer Research U.K., and R.V. by a National Institutes of Health Grant CA R01107032-02, Mayo Foundation, Richard M. Schulze Family Foundation. A.A.M., K.J.H., and R.V. have received research grants from Oncolytics Biotech. ↵2 R.J.P. and F.E. contributed equally to this study. ↵4 Abbreviations used in this paper: DC, dendritic cell; DC-MelReo, reovirus loaded DC; PFA, paraformaldehyde. Parato, K. A., D. Senger, P. A. Forsyth, J. C. Bell. 2005. Recent progress in the battle between oncolytic viruses and tumours. Nat. Rev. Cancer 5: 965-976. Aghi, M., R. L. Martuza. 2005. Oncolytic viral therapies: the clinical experience. Oncogene 24: 7802-7816. Stojdl, D. F., B. Lichty, S. Knowles, R. Marius, H. Atkins, N. Sonenberg, J. C. Bell. 2000. Exploiting tumor-specific defects in the interferon pathway with a previously unknown oncolytic virus. Nat. Med. 6: 821-825. Grote, D., S. J. Russell, T. I. Cornu, R. Cattaneo, R. Vile, G. A. Poland, A. K. Fielding. 2001. Live attenuated measles virus induces regression of human lymphoma xenografts in immunodeficient mice. Blood 97: 3746-3754. Diaz, R. M., F. Galivo, T. Kottke, P. Wongthida, J. Qiao, J. Thompson, M. Valdes, G. Barber, R. G. Vile. 2007. Oncolytic immunovirotherapy for melanoma using vesicular stomatitis virus. Cancer Res. 67: 2840-2848. Benencia, F., M. C. Courreges, J. R. Conejo-Garcia, A. Mohamed-Hadley, L. Zhang, R. J. Buckanovich, R. Carroll, N. Fraser, G. Coukos. 2005. HSV oncolytic therapy upregulates interferon-inducible chemokines and recruits immune effector cells in ovarian cancer. Mol. Ther. 12: 789-802. Miller, C. G., N. W. Fraser. 2000. Role of the immune response during neuro-attenuated herpes simplex virus-mediated tumor destruction in a murine intracranial melanoma model. Cancer Res. 60: 5714-5722. Thomas, D. L., N. W. Fraser. 2003. HSV-1 therapy of primary tumors reduces the number of metastases in an immune-competent model of metastatic breast cancer. Mol. Ther. 8: 543-551. Prestwich, R. J., K. J. Harrington, H. S. Pandha, R. G. Vile, A. A. Melcher, F. Errington. 2008. Oncolytic viruses: a novel form of immunotherapy. Expert Rev. Anticancer Ther. 8: 1581-1588. Prestwich, R. J., F. Errington, E. J. Ilett, R. S. Morgan, K. J. Scott, T. Kottke, J. Thompson, E. E. Morrison, K. J. Harrington, H. S. Pandha, et al 2008. Tumor infection by oncolytic reovirus primes adaptive antitumor immunity. Clin. Cancer Res. 14: 7358-7366. Toda, M., S. D. Rabkin, H. Kojima, R. L. Martuza. 1999. Herpes simplex virus as an in situ cancer vaccine for the induction of specific anti-tumor immunity. Hum. Gene Ther. 10: 385-393. Qiao, J., T. Kottke, C. Willmon, F. Galivo, P. Wongthida, R. M. Diaz, J. Thompson, P. Ryno, G. N. Barber, J. Chester, et al 2008. Purging metastases in lymphoid organs using a combination of antigen-nonspecific adoptive T cell therapy, oncolytic virotherapy and immunotherapy. Nat. Med. 14: 37-44. Moehler, M. H., M. Zeidler, V. Wilsberg, J. J. Cornelis, T. Woelfel, J. Rommelaere, P. R. Galle, M. Heike. 2005. Parvovirus H-1-induced tumor cell death enhances human immune response in vitro via increased phagocytosis, maturation, and cross-presentation by dendritic cells. Hum. Gene Ther. 16: 996-1005. Greiner, S., J. Y. Humrich, P. Thuman, B. Sauter, G. Schuler, L. Jenne. 2006. The highly attenuated vaccinia virus strain modified virus Ankara induces apoptosis in melanoma cells and allows bystander dendritic cells to generate a potent anti-tumoral immunity. Clin. Exp. Immunol. 146: 344-353. Ghiringhelli, F., L. Apetoh, F. Housseau, G. Kroemer, L. Zitvogel. 2007. Links between innate and cognate tumor immunity. Curr. Opin. Immunol. 19: 224-231. Reschner, A., P. Hubert, P. Delvenne, J. Boniver, N. Jacobs. 2008. Innate lymphocyte and dendritic cell cross-talk: a key factor in the regulation of the immune response. Clin. Exp. Immunol. 152: 219-226. Almand, B., J. R. Resser, B. Lindman, S. Nadaf, J. I. Clark, E. D. Kwon, D. P. Carbone, D. I. Gabrilovich. 2000. Clinical significance of defective dendritic cell differentiation in cancer. Clin. Cancer Res. 6: 1755-1766. Vicari, A. P., C. Caux, G. Trinchieri. 2002. Tumour escape from immune surveillance through dendritic cell inactivation. Semin. Cancer Biol. 12: 33-42. Sotomayor, E. M., I. Borrello, F. M. Rattis, A. G. Cuenca, J. Abrams, K. Staveley-O'Carroll, H. I. Levitsky. 2001. Cross-presentation of tumor antigens by bone marrow-derived antigen-presenting cells is the dominant mechanism in the induction of T-cell tolerance during B-cell lymphoma progression. Blood 98: 1070-1077. Pichlmair, A., C. Reis e Sousa. 2007. Innate recognition of viruses. Immunity 27: 370-383. Waldhauer, I., A. Steinle. 2008. NK cells and cancer immunosurveillance. Oncogene 27: 5932-5943. Coca, S., J. Perez-Piqueras, D. Martinez, A. Colmenarejo, M. A. Saez, C. Vallejo, J. A. Martos, M. Moreno. 1997. The prognostic significance of intratumoral natural killer cells in patients with colorectal carcinoma. Cancer 79: 2320-2328. Ishigami, S., S. Natsugoe, K. Tokuda, A. Nakajo, X. Che, H. Iwashige, K. Aridome, S. Hokita, T. Aikou. 2000. Prognostic value of intratumoral natural killer cells in gastric carcinoma. Cancer 88: 577-583. Takanami, I., K. Takeuchi, M. Giga. 2001. The prognostic value of natural killer cell infiltration in resected pulmonary adenocarcinoma. J. Thorac. Cardiovasc. Surg. 121: 1058-1063. Villegas, F. R., S. Coca, V. G. Villarrubia, R. Jimenez, M. J. Chillon, J. Jareno, M. Zuil, L. Callol. 2002. Prognostic significance of tumor infiltrating natural killer cells subset CD57 in patients with squamous cell lung cancer. Lung Cancer 35: 23-28. Albertsson, P. A., P. H. Basse, M. Hokland, R. H. Goldfarb, J. F. Nagelkerke, U. Nannmark, P. J. Kuppen. 2003. NK cells and the tumour microenvironment: implications for NK-cell function and anti-tumour activity. Trends Immunol. 24: 603-609. Esendagli, G., K. Bruderek, T. Goldmann, A. Busche, D. Branscheid, E. Vollmer, S. Brandau. 2008. Malignant and non-malignant lung tissue areas are differentially populated by natural killer cells and regulatory T cells in non-small cell lung cancer. Lung Cancer 59: 32-40. Stanford, M. M., C. J. Breitbach, J. C. Bell, G. McFadden. 2008. Innate immunity, tumor microenvironment and oncolytic virus therapy: friends or foes?. Curr. Opin. Mol. Ther. 10: 32-37. Altomonte, J., L. Wu, L. Chen, M. Meseck, O. Ebert, A. Garcia-Sastre, J. Fallon, S. L. Woo. 2008. Exponential enhancement of oncolytic vesicular stomatitis virus potency by vector-mediated suppression of inflammatory responses in vivo. Mol. Ther. 16: 146-153. Haralambieva, I., I. Iankov, K. Hasegawa, M. Harvey, S. J. Russell, K. W. Peng. 2007. Engineering oncolytic measles virus to circumvent the intracellular innate immune response. Mol. Ther. 15: 588-597. Nguyen, T. L., H. Abdelbary, M. Arguello, C. Breitbach, S. Leveille, J. S. Diallo, A. Yasmeen, T. A. Bismar, D. Kirn, T. Falls, et al 2008. Chemical targeting of the innate antiviral response by histone deacetylase inhibitors renders refractory cancers sensitive to viral oncolysis. Proc. Natl. Acad. Sci. USA 105: 14981-14986. Rosen, L., H. E. Evans, A. Spickard. 1963. Reovirus infections in human volunteers. Am. J. Hyg. 77: 29-37. Coffey, M. C., J. E. Strong, P. A. Forsyth, P. W. Lee. 1998. Reovirus therapy of tumors with activated Ras pathway. Science 282: 1332-1334. Comins, C., L. Heinemann, K. Harrington, A. Melcher, J. De Bono, H. Pandha. 2008. Reovirus: viral therapy for cancer ‘as nature intended’. Clin. Oncol. 20: 548-554. Errington, F., L. Steele, R. Prestwich, K. J. Harrington, H. S. Pandha, L. Vidal, J. de Bono, P. Selby, M. Coffey, R. Vile, A. Melcher. 2008. Reovirus activates human dendritic cells to promote innate antitumor immunity. J. Immunol. 180: 6018-6026. Errington, F., J. Jones, A. Merrick, A. Bateman, K. Harrington, M. Gough, D. O'Donnell, P. Selby, R. Vile, A. Melcher. 2006. Fusogenic membrane glycoprotein-mediated tumour cell fusion activates human dendritic cells for enhanced IL-12 production and T-cell priming. Gene Ther. 13: 138-149. Gerosa, F., A. Gobbi, P. Zorzi, S. Burg, F. Briere, G. Carra, G. Trinchieri. 2005. The reciprocal interaction of NK cells with plasmacytoid or myeloid dendritic cells profoundly affects innate resistance functions. J. Immunol. 174: 727-734. Alter, G., J. M. Malenfant, M. Altfeld. 2004. CD107a as a functional marker for the identification of natural killer cell activity. J. Immunol. Methods 294: 15-22. Martin-Fontecha, A., L. L. Thomsen, S. Brett, C. Gerard, M. Lipp, A. Lanzavecchia, F. Sallusto. 2004. Induced recruitment of NK cells to lymph nodes provides IFN-γ for T(H)1 priming. Nat. Immunol. 5: 1260-1265. Walzer, T., M. Dalod, S. H. Robbins, L. Zitvogel, E. Vivier. 2005. Natural-killer cells and dendritic cells: “l’union fait la force”. Blood 106: 2252-2258. Gregoire, C., L. Chasson, C. Luci, E. Tomasello, F. Geissmann, E. Vivier, T. Walzer. 2007. The trafficking of natural killer cells. Immunol. Rev. 220: 169-182. Ilett, E. J., R. J. Prestwich, T. Kottke, F. Errington, J. M. Thompson, K. J. Harrington, H. S. Pandha, M. Coffey, P. J. Selby, R. G. Vile, A. A. Melcher. 2009. Dendritic cells and T cells deliver oncolytic reovirus for tumour killing despite pre-existing anti-viral immunity. Gene Ther. 16: 689-699. Janeway, C. A., Jr. 1989. Approaching the asymptote? Evolution and revolution in immunology. Cold Spring Harbor Symp. Quant. Biol. 54: (Pt. 1):1-13. Miller, C. G., N. W. Fraser. 2003. Requirement of an integrated immune response for successful neuroattenuated HSV-1 therapy in an intracranial metastatic melanoma model. Mol. Ther. 7: 741-747. White, C. L., K. R. Twigger, L. Vidal, J. S. De Bono, M. Coffey, L. Heinemann, R. Morgan, A. Merrick, F. Errington, R. G. Vile, et al 2008. Characterization of the adaptive and innate immune response to intravenous oncolytic reovirus (Dearing type 3) during a phase I clinical trial. Gene Ther. 15: 911-920. Qiao, J., H. Wang, T. Kottke, C. White, K. Twigger, R. M. Diaz, J. Thompson, P. Selby, J. de Bono, A. Melcher, et al 2008. Cyclophosphamide facilitates antitumor efficacy against subcutaneous tumors following intravenous delivery of reovirus. Clin. Cancer Res. 14: 259-269. Perrot, I., D. Blanchard, N. Freymond, S. Isaac, B. Guibert, Y. Pacheco, S. Lebecque. 2007. Dendritic cells infiltrating human non-small cell lung cancer are blocked at immature stage. J. Immunol. 178: 2763-2769. Treilleux, I., J. Y. Blay, N. Bendriss-Vermare, I. Ray-Coquard, T. Bachelot, J. P. Guastalla, A. Bremond, S. Goddard, J. J. Pin, C. Barthelemy-Dubois, S. Lebecque. 2004. Dendritic cell infiltration and prognosis of early stage breast cancer. Clin. Cancer Res. 10: 7466-7474. Troy, A., P. Davidson, C. Atkinson, D. Hart. 1998. Phenotypic characterisation of the dendritic cell infiltrate in prostate cancer. J. Urol. 160: 214-219. Gerlini, G., A. Tun-Kyi, C. Dudli, G. Burg, N. Pimpinelli, F. O. Nestle. 2004. Metastatic melanoma secreted IL-10 down-regulates CD1 molecules on dendritic cells in metastatic tumor lesions. Am. J. Pathol. 165: 1853-1863. Movassagh, M., A. Spatz, J. Davoust, S. Lebecque, P. Romero, M. Pittet, D. Rimoldi, D. Lienard, O. Gugerli, L. Ferradini, et al 2004. Selective accumulation of mature DC-Lamp+ dendritic cells in tumor sites is associated with efficient T-cell-mediated antitumor response and control of metastatic dissemination in melanoma. Cancer Res. 64: 2192-2198. Kelly, J. M., P. K. Darcy, J. L. Markby, D. I. Godfrey, K. Takeda, H. Yagita, M. J. Smyth. 2002. Induction of tumor-specific T cell memory by NK cell-mediated tumor rejection. Nat. Immunol. 3: 83-90. Dieu, M. C., B. Vanbervliet, A. Vicari, J. M. Bridon, E. Oldham, S. Ait-Yahia, F. Briere, A. Zlotnik, S. Lebecque, C. Caux. 1998. Selective recruitment of immature and mature dendritic cells by distinct chemokines expressed in different anatomic sites. J. Exp. Med. 188: 373-386. Prestwich, R. J., E. J. Ilett, F. Errington, R. M. Diaz, L. P. Steele, T. Kottke, J. Thompson, F. Galivo, K. J. Harrington, H. S. Pandha, et al 2009. Immune-mediated antitumor activity of reovirus is required for therapy and is independent of direct viral oncolysis and replication. Clin. Cancer. Res. 15: 4374-4381. Gerosa, F., B. Baldani-Guerra, C. Nisii, V. Marchesini, G. Carra, G. Trinchieri. 2002. Reciprocal activating interaction between natural killer cells and dendritic cells. J. Exp. Med. 195: 327-333. Piccioli, D., S. Sbrana, E. Melandri, N. M. Valiante. 2002. Contact-dependent stimulation and inhibition of dendritic cells by natural killer cells. J. Exp. Med. 195: 335-341.